THE roaring of stags is an unearthly sound that sends shivers across skin. It echoes from the rock walls of corries like the groans of the tortured. People passing along the A87 are unaware that a few hundred feet above their cars is a world that has changed little since the glaciers retreated, a world where animals bellow mating calls and raptors soar. I feel I am crossing a line between one epoch and another as I climb patiently up Druim Thollaidh ridge towards the summit of Sgurr Coire na Feinne. 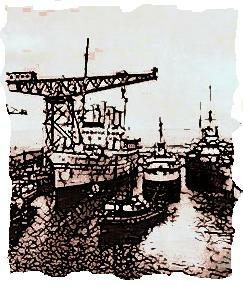 The distant hum of engines has faded. Here there are animal noises and whispers of wind in brown grass. And that’s all . . . 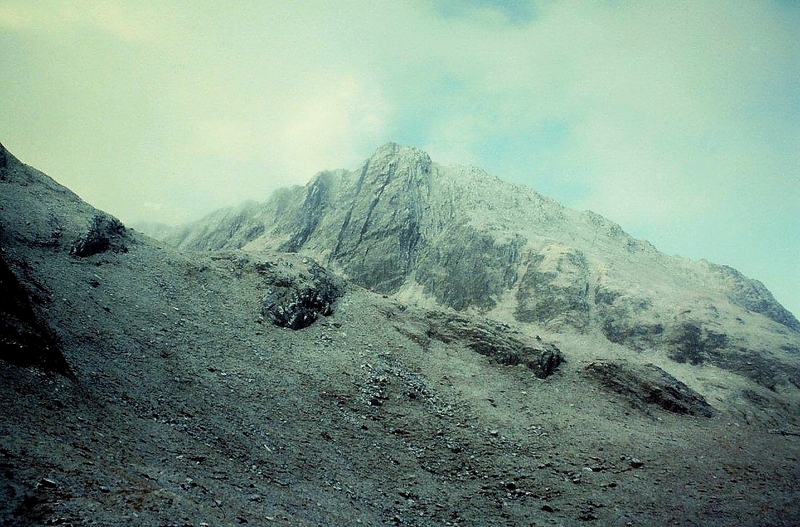 The Cluanie Ridge stretches from Loch Cluanie in the east and forms the rocky southern wall of Glen Shiel, almost mirroring the northern wall and the Five Sisters of Kintail. 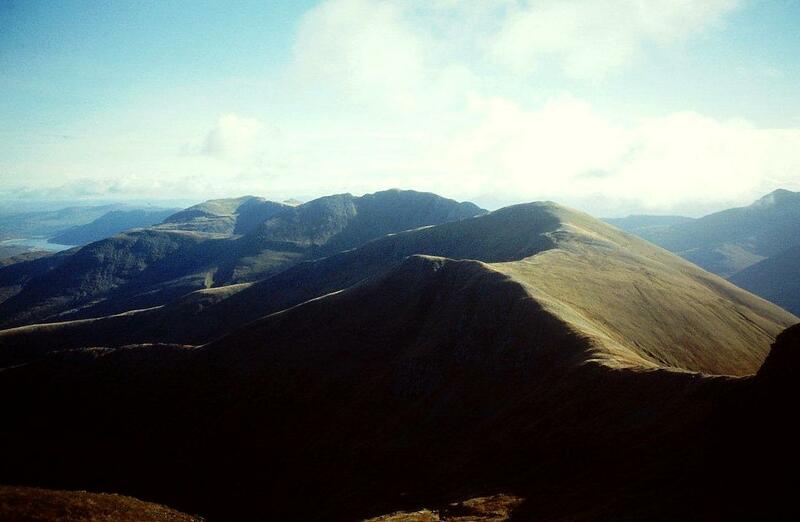 It incorporates seven Munros and is one of the classic walking routes of the Western Highlands. 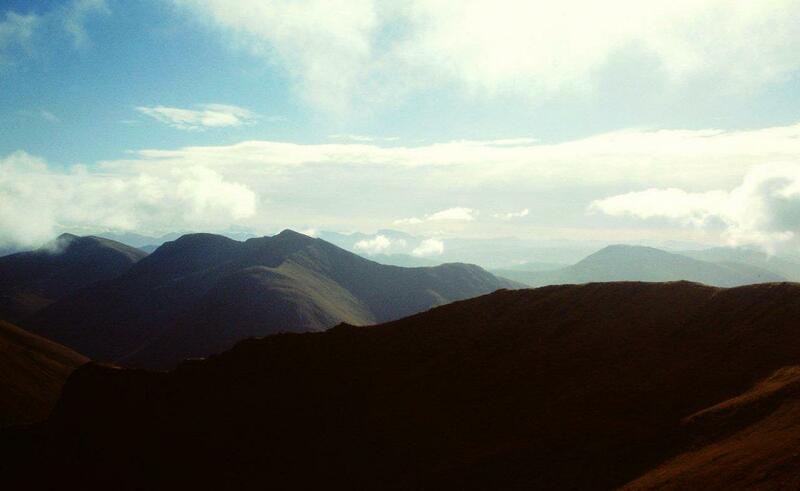 For the fittest walkers, Sgurr na Sgine and The Saddle can be added at the western extremity, taking the toll of Munros to nine. That’s a big day out. My plan for today is not so ambitious. I’ve walked the eastern end of the ridge and climbed the two western outliers, but not the middle section of three Munros. So once on the summit of Sgurr Coire na Feinne, which at 902 metres (2,959ft) falls disappointingly short of the magic 3,000ft for Munro status, I set off towards Sgurr an Doire Leathain. This is a beast of 1,010 metres (3,313ft) altitude. Hidden from view behind its shoulders are Sgurr an Lochain (1,004m or 3,293ft), Creag nan Damh (918m or 3,011ft), and some lumpy pieces of ground which fail to reach Sir Hugh’s 3,000ft benchmark but remain formidable obstacles nonetheless. All goes well until a blizzard sweeps in and envelops the summit of Creag nan Damh. I’m not concerned by this development because I’ve climbed my peaks. So I slither down a stalkers’ path into Corie Toiteil and follow the stream towards Glen Shiel and the road. Down in the valley the snow turns to rain as night falls. It’s nearly three miles back to Shiel Bridge and another mile to our holiday chalet at Ratagan. The A87 is a fast road, and cars and lorries rush past in the darkness, spraying filthy water from puddles and gutters. I’m not in a pleasant or a safe situation, so I stick my thumb out in an attempt to persuade a driver to give me a lift. Eventually a van pulls up and I climb into the back and settle down in a heap of old clothes and rags. Two men and a woman occupy the front seats. They belong to the traveller community, they tell me, and live in a caravan on an industrial estate a few miles up the road at Kyle of Lochalsh. Rags are their livelihood. They collect old clothes and sell them on. They are rag and bone people. 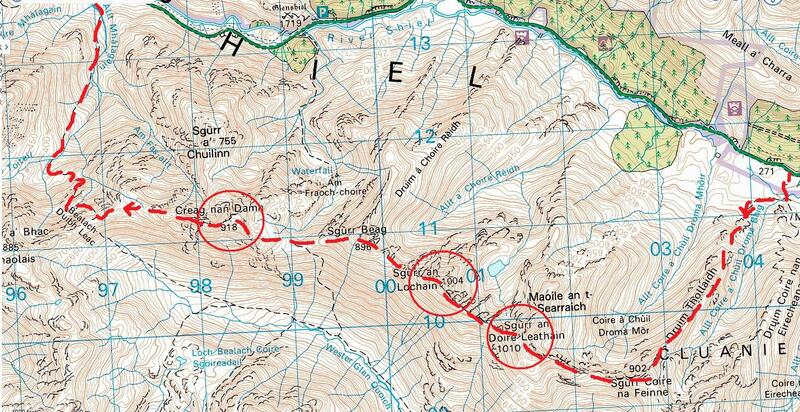 After they drop me at Shiel Bridge I wander towards Ratagan in the pitch black night as rain falls cold and steady. And I think: it’s a strange world this. It’s a world where wild beasts roam the hills, beyond the walls of our warm houses and the limits of our knowledge. And it’s a world where those who have least to give will share what little they possess to help a fellow wanderer. 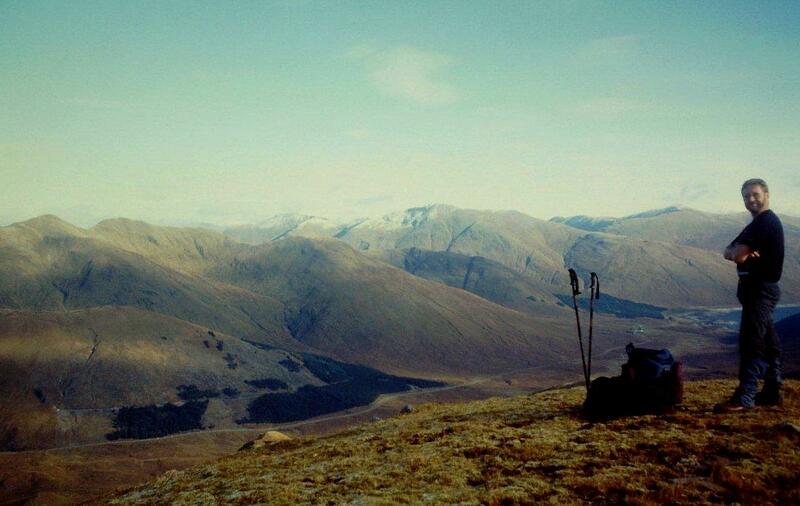 This entry was posted in Climbing, Environment, Hiking, Life, Mountains, Recycling, Weather and tagged Munros, outdoors, Scotland, The Munros. Bookmark the permalink. That final sentence seems to be so true throughout the world Alen. As for stags roaring, it’s a sound I look forward to hearing every autumn. If you are lucky you can often hear them in the Lakes as well (High Street, Riggingdale and Kentmere area). Hi David. I think that was the first time I heard stags roaring, and it took me a couple of minutes to work out what it was. I’ve seen red deer on High Street, on the Martindale side, but not heard them roaring up there. It’s a spooky sound. You are probably right about people with “least to give”, but in the 1980s I got a lift down Borrowdale in a Rolls Royce with a brewer and his family! Alastair, if you fell in a septic tank (which you probably have at some point) you’d come up smelling of roses! 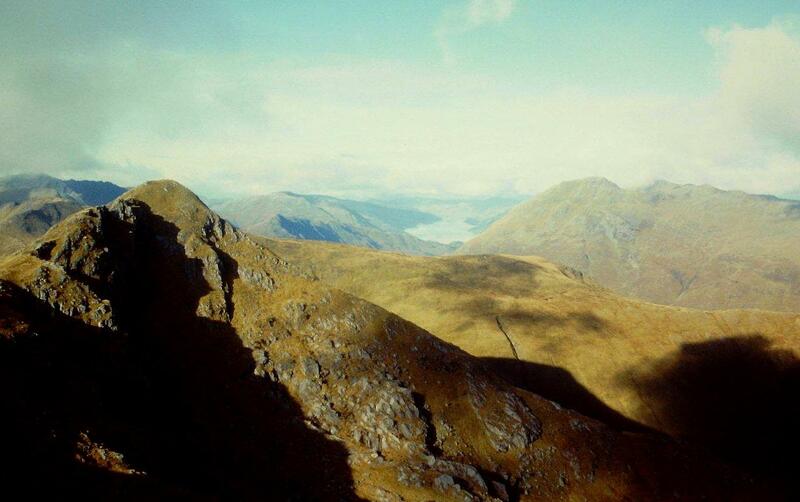 Playing golf as a lad I met another golfer who swore his dog could detect the ghosts and phantoms of Glen Shiel; it always acted weird when he was up there. I need to put the peaks on a ‘bucket list.’ I’ve been in the valley, but not up above it. And after the blizzard and the rain and the A87 slush you probably didn’t look out of place on a back seat full of rags! Hi Chris. There are a few spooky places in Glen Shiel. In fact, there was a battle there once involving an alliance of Jacobites and Spanish soldiers against Red Coats, so perhaps the dog was on to something. And it’s not the first time I’ve looked out of place on a pile of rags. Probably won’t be the last either. I love the beginning of your log no. 14. The magically universe that sometimes closes in on you when you step into a world where it is nature that determines how your walk will be. The end of your story ties it all together in a marvellous unexpected way. 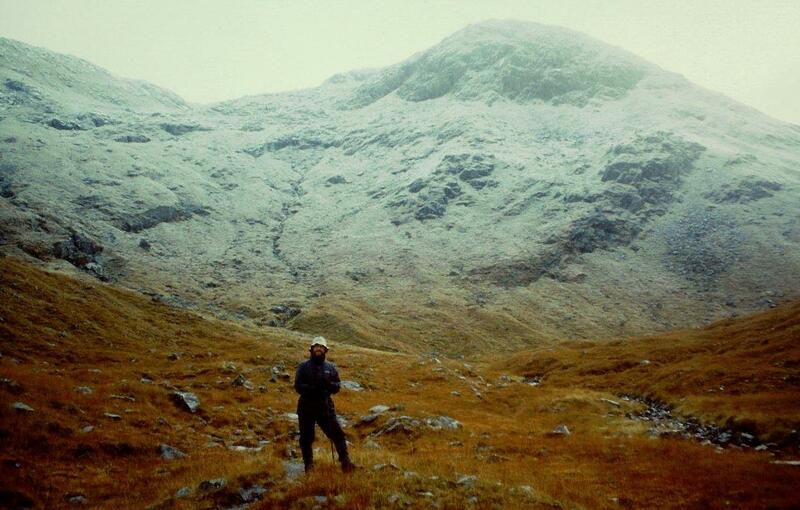 Thank you for sharing your experience between Munros, snow showers and warm hearted people. Hanna, thank you for your wonderful comment. You always brighten my day with your take on life. It is always the ones who have the least who are the more generous – we used to notice that when we went Carol Singing (for charity) as kids – the big houses gave very little if they answered the door at all, the council houses always listened, smiled and gave us something. 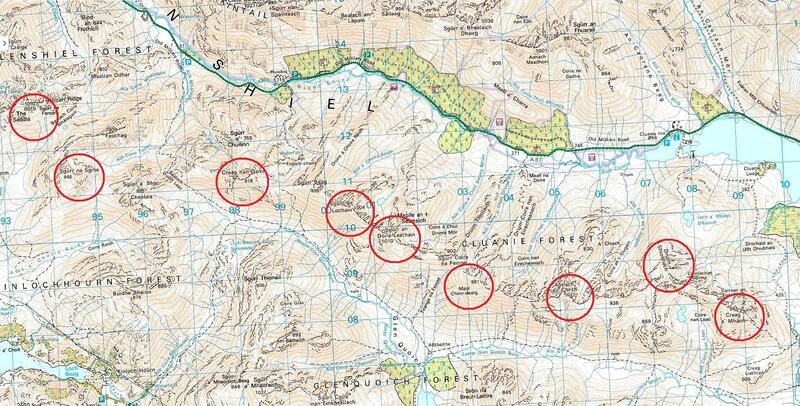 That route onward from Creag nan Damh to the pass you descended from – didn’t you find that ‘lump’ in the way immediately on leaving the Munro very awkward? I was really glad I’d gone the way I did and could ascend, rather than descend, it! Hi Carol. I remember the route being very slippery and awkward after leaving Creag nan Damh because the snow was falling quite heavily and I wanted to get down before the daylight vanished. At that point I was passed by a soldier who was intent on doing the full nine Munros and was planning to descend the Forcan Ridge in the snow and the darkness. I never saw him again so perhaps he’s still up there. A lovely story, Alen, and those are beasts of mountains. A big day out for sure! I remember we used to go over the Ratagan Pass (in the car, that is!) to Glenelg where there’s a wonderful old turntable ferry still operating between there and Skye. Hi Jo. Yes, we drove over to Glenelg. It’s a lovely little place. In fact there’s another Munro down that way I’ve yet to climb, Beinn Sgritheall, but I didn’t get chance on my last visit. Still, that’s a good excuse for a return to the area sometime. That’s one that I have actually climbed part way up… a very long time ago! When we were staying in Glenelg. So remote there, with red deer all over the road. Just beautiful!